Check it out: There's a dining option in the State Museum once again. 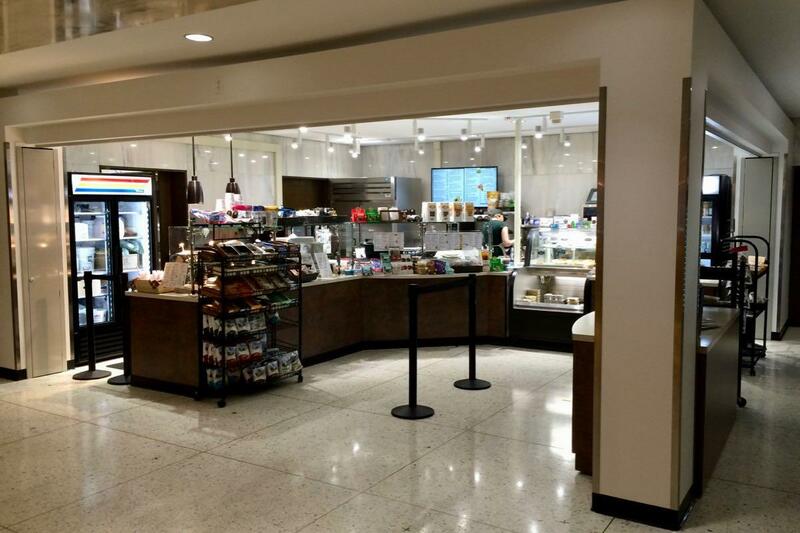 The Steuben Street Cafe opened March 1 in a space on the mezzanine, which overlooks the front lobby of the museum. It's tucked into a space in the back of the mezzanine, and with the seating that was already there out front by the overlook. The cafe is a spin-off of the Steuben Street Market on Pearl Street downtown. And it offers a range of snacks, sandwiches, salads, soups, smoothies, and drinks, with an emphasis on local and healthier options. "What were doing is basically the same thing as what we do at the main location on Pearl," said Charissa Pratt, who's now the majority owner of Steuben Street Market. "We're trying to bring in more vegan options and gluten free options -- not only for people in the museum, but people who work in the [Empire State Plaza] concourse." Pratt said all the cafe's prepared foods are made by Steuben Street's chef, Jason Eobbi. There's also a lineup of breakfast items in the mornings, and a $5 kids menu. A scan of the menu we picked up Thursday. The cafe has been in the works for a while, Pratt said. Steuben Street Market -- which opened about two years ago at 58 North Pearl Street -- had responded to a request for proposals from the state, and then worked through the various approvals needed while the space was fitted out. Steuben Street Cafe is open Tuesday-Sunday, every day the State Museum is open. Tuesday-Friday it opens at 7:30 am for people who work in the building, and then 9:30 am for the general public, closing at 3:30 pm. On Saturday and Sunday it's open 10-3 pm. On the second floor mezzanine. Back in the early/mid 1990s Yono Purnomo cooked and served lunch in that same space. It was when his restaurant was on Hamilton St. I recall it lasting a year or two. I think his food was too exotic for the target audience. This sounds like it'll have wider appeal.